The warm temperate and subtropical forests of Japan are home to one of the world’s largest bay trees, Machilus thunbergii. Massive specimens are found throughout Japan, at temples and shrines, public parks, and of course in their native forests. This tree is one of southern Japan’s most impressive broad leaf hardwoods, outdone only by the camphor tree, Cinnamomum camphora. This young Machilus is already forming the lovely branching that distinguishes this beautiful bay tree. The most notable features of this giant are its large evergreen leaves, broad sweeping crown, lovely tiered branching, and its shear mass. The overall impression one gets is of a tropical rain forest tree, particularly when covered in epiphytic ferns. which it often is. In places where old growth forest still exists, this tree stands out as one of the more impressive species, and indeed is the second most massive broad leaf hardwood next to the camphor tree, Cinnamomom camphora, in Japan’s southern forests. The green penny fern, Lemmaphyllum microphyllum, covering a massive Machilus thunbergii. This old tree shows off the lovely branching of the species. Tachibanayama, Fukuoka Prefecture, Kyushu, Japan. 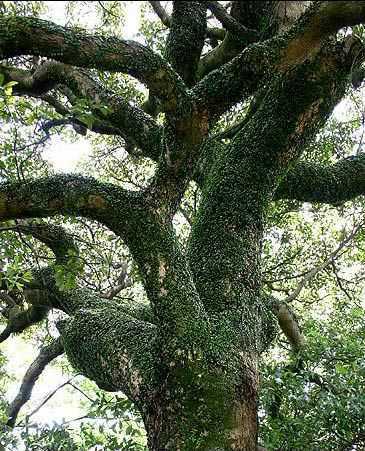 In Japan this tree is found in warm temperate forests in the mountains of Kyushu, Shikoku, and Honshu. 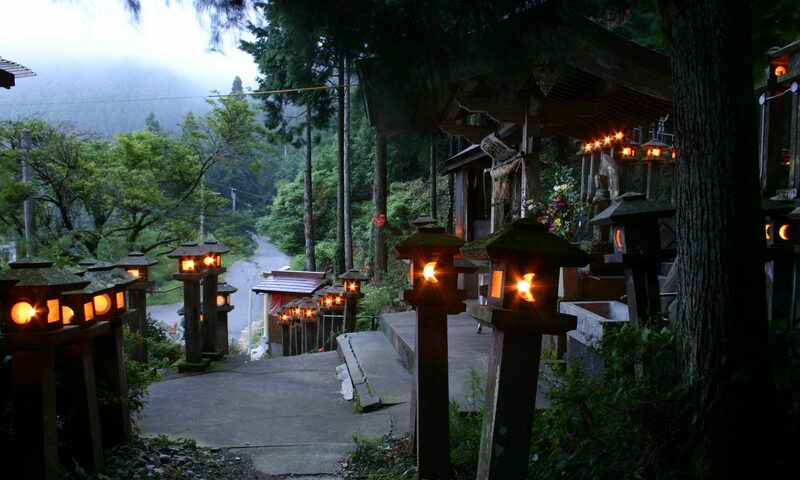 On Yaku Island just south of Kyushu it grows as high as 1200 meters up mountains, but is found in progressively lower altitudes further north, even into southern Nagano Prefecture on Honshu. It reaches its northern limit in southern Aomori Prefecture along the Sea of Japan coast, and to southern Iwate Prefecture on the Pacific side. In these northern areas it is limited to seaside forests, where it is a much smaller tree in all respects. It is also found throughout Japan’s southern islands to Okinawa and beyond to Taiwan, South Korea, China, and the Philippines. 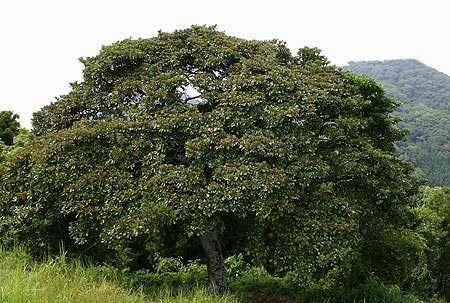 This tree is a member of the Laurel Family (Lauraceae), a diverse and widespread group found throughout tropical and subtropical areas of the world in particular. Southeast Asia has a wide swath of these laurel forests where this family dominates. Here in southern Japan, such forests are common at lower elevations, and this species is prominent in them. 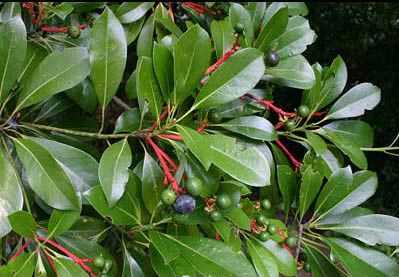 Some botanists consider Machilus to be a subgenus of Persea, the genus most commonly known as bay trees. 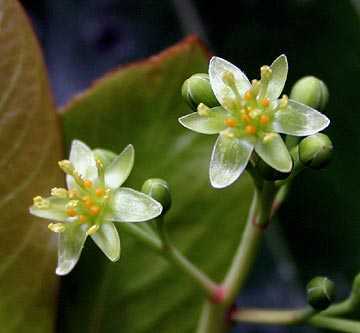 The small star shaped flowers are born in clusters and flush at the same time as the new leaves – usually in mid May. The bark of this tree has been used for centuries as a dye in making a hand woven silk fabric called tobi hachijo, named after Hachijo Island, south of Tokyo in the Pacific Ocean. The bark is also mixed with various other plants in making an aromatic incense used in Buddhist temples and at Buddhist alters in private homes. More recently scientists have isolated powerful antioxidants (lignans) from the bark. The wood itself is valued and used in making instruments, furniture, and is even used in general construction. The Japanese name for it, tabunoki, means “crimson camphor tree” due to the lovely red-brown color of the heartwood. As a old tree it can become spectacular, growing both tall and broad. There is an old growth forest near my house on Tachibanayama (Standing Flower Mountain) that has an incredible old growth broad leaf evergreen forest, including truly massive kusunoki (Cinnamomum camphora), and at its top is an outstanding grove of Machilus. These trees seem to be epiphyte magnets, especially for the green penny fern (Lemmaphyllum microphyllum). Often their trunks are literally coated with this little fern. To date I’ve seen no orchids on them, but that is likely a function of the paucity of epiphytic orchids in the Fukuoka area. This is a lovely species who’s remaining old growth stands deserve protection. Unfortunately, because of the popularity of the incense made from its bark, it is being over-exploited in parts of its range. The dark blue fruit of Machilus thunbergii matures by mid summer and quickly falls thereafter. Fresh seed is fairly easy to germinate. This tree is fairly slow growing despite its ultimate potential size. Given their wide natural range they should do well in warm summer climates with not too cold winters provided they get ample moisture. These are trees of wet forests high in humidity year round and can’t be expected to endure dry climates long. Based on their native range in Japan, I would guess they are fully hardy to USDA cold hardiness zone 8 at least. Folks in the warmer parts of the UK say that their plants don’t do well long term, and yet it has been grown at least as far north as Birmingham, Alabama which is zone 7b. Likely the issue is the long, warm summers which gives the new wood a chance to fully mature before the winter hits. Without a doubt this is one of my favorite Japanese trees. If you live in a warm summer climate or even a cool climate (provided the winters are not severe) this one is worth trying. It will lend a distinctly tropical look to your garden. Here is a fine example of old growth forest Machilus on the top of Tachibanayama, Fukuoka Prefecture, Kyushu, Japan. 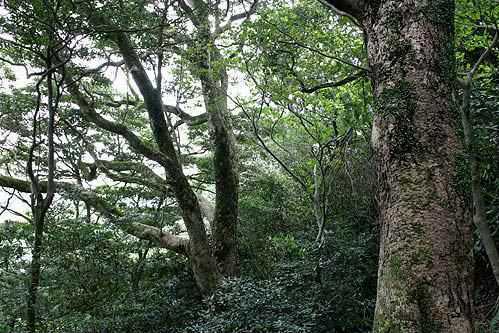 These forest giants reach heights of 20 meters or more in this pristine forest. Thanks for your information about the Machilus thunbergii trees. Saw a large specimen in the Honmaru area of the grounds of Edo Castle, along with some impressive Neolitsea sericea. I’ve seen some pretty massive Machilus here on Kyushu since they can be found anywhere below ~600 meters, but none as big as some you see in pictures on the net. I’ve not seen the one at Edo Castle yet. The next time I’m in Tokyo, I’ll have to find that one. Neolitsea sericea is by far much less massive than M. thunbergii, and in turn the Machilus is much smaller than Cinnamomum camphora – the true monster hardwood of Japan’s warmer forests. I am looking for the Machilus Thunbergii sticks, but I couldn’t find them.